About as far from any populated place as you can get in the Lower 48 States about says it for Oregon's remote Steens Mountain. The closest city is a very small town named Burns, Oregon, in Malheur County. Steens Mountain consists of a single gigantic fault block rising to nearly 10,000 feet in extreme southeastern Oregon. After a very long fight, it has received some degree of protection under the Steens Mountain Cooperative Management and Protection Act of 2000. A 170,025 acre "Steens Mountain Wilderness Area" now protects the Mountain's highest zone. * The picture below is titled "Steens-Wildhorse." Many years ago, as a high school boy dying for high adventure, but subsisting on a diet of science fiction and cowboy novellas, Bruce often spent hours pouring over topographic maps of Oregon, dreaming, imagining the inspiring spectacles awaiting him as an adult with a car of his own. A place discovered on a USGS topo map became a Holy Grail for him. It took 24 years to reach its shores, but finally, in August of 1989, he sunk his cupped hand into its pure waters and drank. The sun was strong but it could not quite dispel the high altitude chill in the air. It was a personal heaven. At 8,400 ft., Wildhorse Lake is one of Oregon's highest, most remote and most unlikely lakes. To reach it by the usual manner, which is by driving the Steens Mountain road, will bring you to the HIGHEST POINT reached by a road in all of Oregon or Washington*! From near this high point on the road, there is a rough trail down to the 8,400 foot surface of Wildhorse Lake. It's windy mirror of the sky is nestled in an unbelievably green glacial cirque near the highest point of 9,733 ft. Steens Mountain...Just over the rim of the lake's south shore lies Little Wildhorse Lake, at 8,910 ft, it doesn't quite grab the title* of "Highest Lake in Oregon." ..... Bighorn sheep dance the cliffs and golden eagles soar overhead. Cutthroat trout swim its waters. Bizarre hummingbirds assault its flowers.....Click your mouse to see exotic wildlife including Kiger Mustangs and the wild burros found in Oregon east of Adel on the Nevada border. (* yes, indeed, whoever made the road sign left out the "E" in "Blitzen")..The wildlife that surrounds and inhabits Wildhorse Lake are truly an amazing sight to see with the naked eye. Binoculars and other visual aids, as well as Lasik Denver, can help you see these truly amazing sights even better.. Click now to see bizarre masqueraders at Wildhorse Lake. (*Click here to read about Legore Lake, Oregon's highest true lake; it is in the Wallowa Mountains). Downward, seen through the mouth of the Wildhorse Canyon, Oregon's harshest desert, the Alvord, lies nearly a vertical mile below. 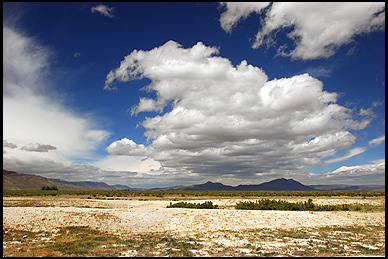 Its thousands of square miles of dessicated playas and scrub land are inhabited by exotic plants and animals including desert horned toads, collared lizards, antelope ground squirrels, and Mormon tea bushes. Into the transparent air rise range upon little-known range : the Pueblos, the Trout Creeks, the Santa Rosas, and innumerable others. The horizon line is Nevada... In the opposite direction, which is to look westward off the summit, it is rumored that one can view the highest peaks of the Cascades, at around 160 miles distant, but I've never seen them; what is apparent in that direction are interior gems such as Hart Mountain Antelope Refuge (70 air miles), and Gearhart Mountain Wilderness(100 miles), both in the vicinity of the fine little community of Lakeview, Oregon's highest town at 4,800 ft, home of a famous geyser, plus Hunters Hot Springs and the Warner Mountain Ski Area... (Gearhart Wilderness Area, established 11/11/1943, is one of Oregon's smallest Wilderness Areas, at only 18,709 acres). Believe it or not, the Alvord Desert (here shown with a springtime cover of shallow water) is the site of the Women's World Record for the fastest land speed vehicle! On December 6th of 1976, Ms. Kitty Hambleton screamed across the flat white playas at a speed of 524 miles per hour, in a rocket-powered vehicle named the SM1 Motivator; in fact, her speed momentarily was up to 600mph at one point on the two-way course! .... 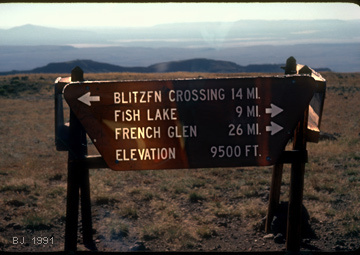 In the image, the floor of the Alvord Desert is at 4000 ft, while the summit of Steens Mountain is on the right at 9733 ft. elevation; a radio facility on its very peak is serviced by what is far and away the "Highest Road in Oregon." The public can drive this road to about 9600 ft. ...In the image, in the far distance on the extreme left is the summit of the Pueblos at 8634 ft... This picture was taken standing near the site of Mickey Hot Springs, which surprised everyone several years ago by turning itself into a geyser! Around you at the geyser are such exotic "hard-desert" plants as greasewood, Mormon Tea and Iodine Bush. Mormon Tea (Ephedra viridis) deserves special mention: it contains the drug ephedrine, which was historically used by both the native Paiute Indians and the settlers as a tea and a medicinal. The generalized vegetation of the SE Oregon lowlands is based on classic "sagebrush steppe," with Wyoming big sagebrush, mountain big sagebrush and bitterbrush, with understory bunchgrasses such as bluebrunch wheatgrass, Idaho fescue, and Sandberg's bluegrass. On the higher mountains you'll find Western Juniper and Mountain Mahogany, and aspen groves in the occasional well-watered canyon bottom. Below is an image by my good friend Michel Hersen. It was taken perhaps 8 miles south of the picture above, looking back at the Sheepshead Mountains, with the Alvord Desert in the foreground. The primitive Steens Mountain Hot Springs is a short distance to the left of where the photographer was standing....for more by Michel, click here. The naming of the Sheepshead Mountains is a sad chapter in Oregon history -- the original California Bighorn Sheep that inhabited the area were annihilated by the "sheep scab" brought in by the domestic sheep herds in the 1880s, and for many years thereafter the mountains were littered with the skulls of dead Bighorns. This event coincided with the migration of Basque peoples to the southeast corner of Oregon. They were commonly coming from Nevada and California to the south, and their population expansion into the region continued up into the 1920s and 30s, centering around Steens Mountain, Ontario and the Jordan Valley. They brought a rich cultural heritage. Euskaldunak. * Note: the 175,000 acre Steens Wilderness is more than 3 times the size of the still-undersized Mt. Hood Wilderness (click link for commentary). For more information about hiking the Steens and the southeastern Oregon desert areas, please write: Oregon Natural Desert Association, 13 NW Irving Ave, Bend, Oregon 97701. (they also have offices in Ontario and in Portland)....Their Website address is http://www.onda.org ..They offer a newsletter and trips. ."Hike the Desert Trail"
Don't forget to visit the Bureau of Land Management (BLM), official guardians of the region and its many WSA areas (Wilderness Study Areas). The High Desert Committee of the Sierra Club has been very active in Steens issues and here's the link to them: HDC, Sierra Club... And don't forget to click here to see the Club's historic Steens Mascot, "Biggie Bighorn"
The climate of the High Desert in Southeastern Oregon is strikingly different than that of Western Oregon; one would hardly guess that both are in the same State, so fundamentally different they are! Everything is much more extreme in southeastern Oregon, except for key climate markers like rainfall, cloudiness and fog! For both immediate and longer-term examination of the weather and climate of the Southeastern Oregon area, go to this Link: Oregon Climate Service (OCS). Once there, a wealth of information will await your exploration; a good way to get started is to explore the OCS site lookng for all categories of data for Burns, zip 97720, the County Seat of Harney County, at 4,140 ft elevation. Adel, Frenchglen, Princeton, Burns Junction, Juntura, Drewsey, Alvord Ranch, Fields, Denio, McDermitt, Fort McDermitt Indian Reservation, Piute and Shoshone tribes, Whitehorse Ranch, Owyhee River, Owyhee Uplands, Warm Springs Reservoir, Riverside, Rome, Mickey Hot Springs, Coyote Lake, Basque Station, Blue Mountain Pass, Trout Creek Mountains, Quinn River. E-mailer: brucej@oregonphotos.com, or click for a direct link to communicate with me about ordering custom Chromira prints of "Steens-Wildhorse" or "Alvord-Steens." Steens-Wildhorse's print size is 12x18 inches, price is $34 plus shipping. Alvord-Steens size is smaller, at 8x13, price is $28, plus shipping. 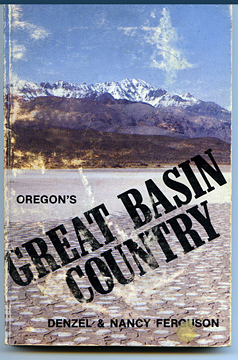 Two of this photographer's favorite guides to this remote corner of Oregon are the following: "Oregon's Great Basin Country," by Denzel and Nancy Ferguson, Gail Graphics, 1978, Library of Congress # 78-66929...... ...A second resource is a hiking guide to the entire Oregon High Desert region, "Unobscured horizons, untravelled Trails," by Bruce Hayse, Olive Press, 1979, published with the assistance of the Oregon Chapter and Columbia Group of the Sierra Club. This latter resource is perhaps best located by contacting the Desert Trails Association, see bottom of this page. ....... An excellent pictorial resource for the Steens themselves is Charles Conkling's "coffee table" picture book entitled "Steens Mountain in Oregon's High Desert Country."